Elor Azaria, the Israeli soldier convicted of shooting and killing a Palestinian in the head while the Palestinian was lying on the ground wounded, had his sentence reduced to nine months by an Israeli judge this week. Last February, Azaria was sentenced to eighteen months for the 2016 killing, which was captured on camera by a bystander. He began his prison time in August 2017. With the new sentence reduction, he will be released in May. The Chief Military Prosecutor for Israel, Sharon Zagagi Pinhas, opposed the granting of parole for Azaria, saying that he has shown no remorse for the murder of a prone, wounded man. During Azaria’s trial, the prosecution had pushed for a sentence of 3 – 5 years for the murder. This contrasts with the Israeli military prosecutor’s stance toward Palestinians – children who throw stones at invading soldiers are given a mandatory four-year prison sentence. After the early release of Azaria was announced, Israeli conscientious objector and editor of +972 Magazine, Haggai Mattar, said on Twitter that when he is released in May, Azaria “will have served a shorter sentence than me and my friends who refused to serve in the army of occupation”. 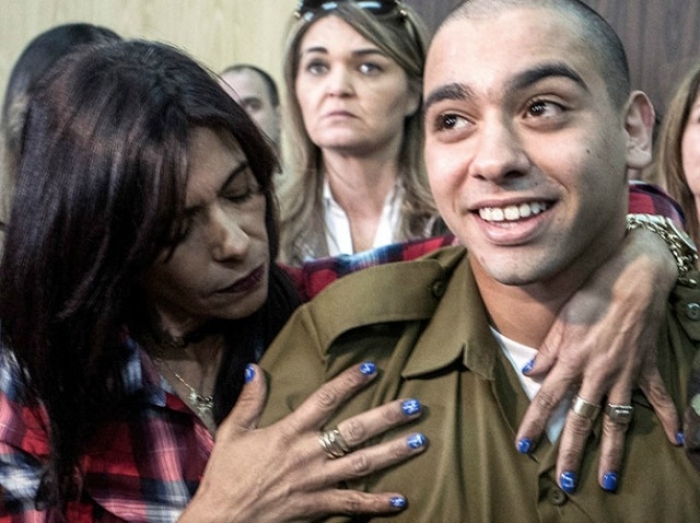 Azaria’s case garnered national and international attention, and Israeli Prime Minister Binyamin Netanyahu was among those who called for the soldier’s early release. The graphic video of the murder committed by Azaria in March 2016, which was filmed by a Palestinian cameraman from B’Tselem Israeli human rights group, went viral and sparked international rage. The footage shows Abdul Fatah al-Sharif lying on the ground after having been shot ten minutes prior, when Azaria comes up to the wounded man and shoots him in the head at close range, killing him. In the video, Elor Azaria is seen talking on the phone, then hanging up and stepping closer to Al-Sharif, and then shooting him in the head from a very close distance in the presence of Israeli ambulances.